The ladies' World Time Reference 7130 displays the 24 time zones in a new white gold version, with hand-guillochage in the grey-blue centre of the dial. 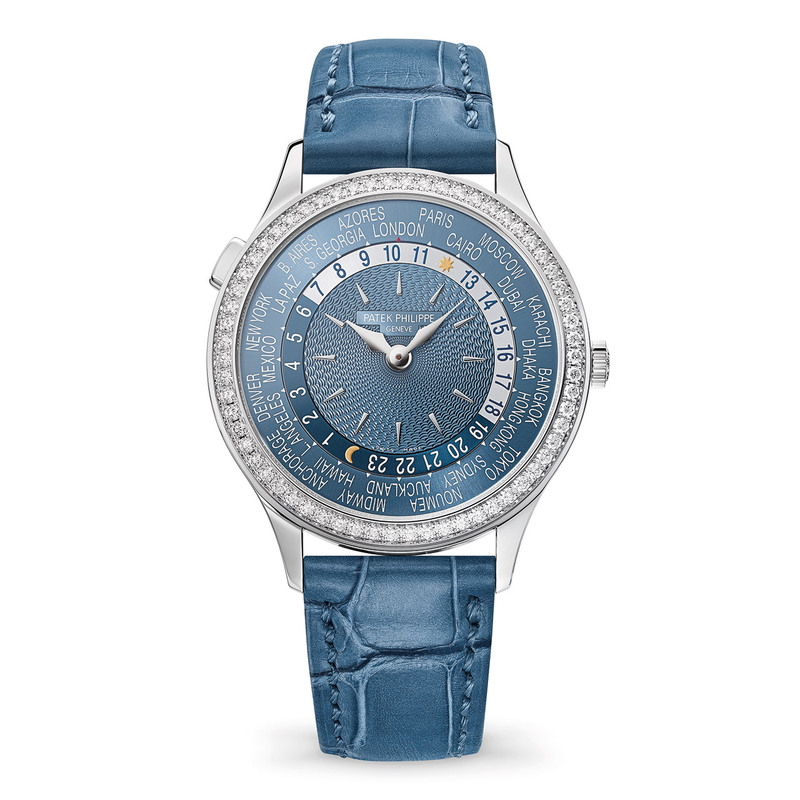 This delicate shade, illuminated by diamonds, is echoed by the city disc and the peacock blue of the shiny alligator strap. Local time is shown by central hands; the corresponding city name appears above the small red arrow at 12 o'clock, to indicate the time and whether it is day or night. The other 23 time zones are read at a glance on the 24-hour disc that rotates counter-clockwise inside the city disc. The time zone is changed simply by pressing the pusher at 10 o'clock. The name of the new city then appears at 12 o'clock. Mechanical automatic, 240 HU calibre, 239 components, 33 jewels, 21,600 vib/h, 22k gold micro-rotor, Gyromax® balance, Spiromax® balance spring, minimum 48-hour power reserve. Hours, minutes, world time with 24 time zones on a 24-hour display with day/night indication. 18k white gold, 36 mm. Bezel set with 62 diamonds (~ 0.82 ct). Sapphire crystal, front and back. Water-resistant to 30 metres (3 bar/100 ft). Shiny peacock blue alligator. 18k white gold buckle set with 27 diamonds (~ 0.21 ct).